Gold Classic Controller Pro? Pah! 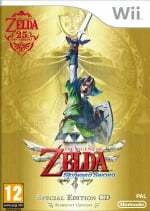 Legend of Zelda: Skyward Sword is one of a handful of Wii MotionPlus-exclusive games for Wii, but series leader Eiji Aonuma revealed in a recent interview that it nearly panned out very differently. Look at all these things you can do with Motion Plus, why wouldn't you use this in a Zelda game? It would be strange not to! this is like really old news. i mean this is olds. @GuardianAcorn The IGN article we sourced is dated June 15, 2011. If you have an older version let us know! Wow, this is news to me, I didn't hear anything about this. Thankfully Katsuya Eguchi was able to convince Eiji Aonumu to keep the MotionPlus controls in the game. Everything that I have heard about the controls for this game say that they work extremely well and it would have been a shame not to experience that. Oh and of course being able to get that gold Wii Remote Plus is an especially nice bonus as well. Love it how open and honest Nintendo are about their developments and also admit to their failures! I actually thought I'd read it here before, but I searched the site for zelda motion plus and it came up with a thousand plus results, yet each page shows the same ten or so links. Not very useful. Me want that Wii Remote! I'm glad Eguchi was able to convince Anouma, the motion plus use in this will be awesome. A gold Wii Remote, huh? Rumor is that Skyward Sword was originally going to run only on the Vitality Sensor. FYI You aren't going crazy as far as we know! So the only reason to have motion plus wouldn't have dropped...ok Nintendo sometimes I don't understand you at all. What are you thinking, fool!? I wish more games besides lame party games would use Motion Plus. I loved it for Red Steel 2 and I think it could be great for alot of games if used right. I still like my Gold Classic Controller Pro, but I LOVE that too! Still don't have one at all. I'd rather not bother since it seems like no 3rd parties were all that interested, but as long as they stay WiiU compatible I'll pick one up eventually. Once WiiU is around and we're still using remotes I'm sure the Remote + will make sense as an upgrade; right now it's annoying. so no release date for this game still? Not even a ballpark? I thought Corbie said it looked 'almost done'. whats the hold up? That would of been pretty bad if they did. Then again I have 4 original Wii motes still without Wii motion plus. Designing a game focused on a controller is lately a quite frequent Nintendo mistake. Might be Aonuma was not that wrong after all. Is the gold Wiimote a pack-in with Syward Sword or the some 25th Anniversary Zelda package? I saw the entire presentation but I'm still not sure. And I don't blame the guy for wanting to make a non-Plus version, more ways to play it means more sales. If they port an HD version to WiiU you'll be playing it like a DS game, slashing with your stylus, which I'm sure was in the back of that guy's mind somewhere while he's been working on this the past few years. . I'd be pissed if they didn't have Motion Plus used in SS. That was the only reason why I bought Wii Sports Resort! Then again, I should've known they'd release a special edition Wii Remote Plus with the game... Do want. This is not new. I already knew for months that Aonuma almost gave up because he couldn't get it right. I am happy that they pulled through, since it could give the game better fighting and overall more freshnes! I really want that gold remote. Finally gives me a reason to replace my original Wiimote I got with my Wii! 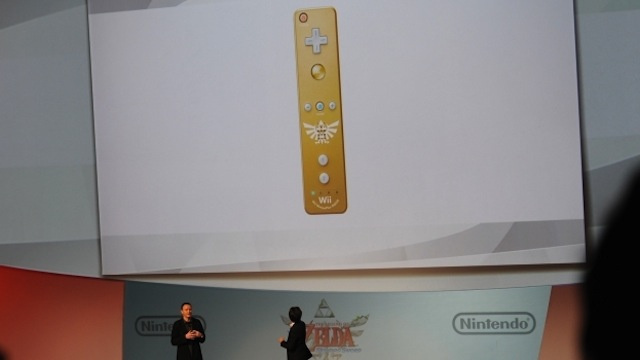 Wait, the golden wiimote+ will come packaged with the game? If so, that's awesome! I'm sure the gold Wii Remote Plus will be part of a special package. I doubt it will be sold separately, but who knows? I'm sure I won't be with the majority on this, but I'd be a lot more interested in this game if they scraped plans to release it on the Wii and instead reworked and released it for the Wii U, with a global achievements system, HD graphics, etc. I doubt I'll play this game at all on the Wii. However, my 10 year old will, so we'll get it anyway. Gold wiimote ftw, skyward sword looks great, might beat OOT 3d for best zelda ever! looks like this marks the death of the wii though.. sad but wii U only a little way off.